Philly Teacher: Who's Tracking You? Just recently I heard a story on Fresh Air, a radio show on public radio, about companies that track your web surfing habits and sell them to ad agencies. It was a fascinating story, and a chilling one. There are companies making tons of money off of your browsing habits. By tracking where you go, ad companies can advertise products based on your specific habits. While this is nothing new, and many argue that at times it makes things like Internet searches easier, it can be a little creepy. The guest on the show, Julia Angwin from the Wall Street Journal, told a story about looking at shoes online and then having the shoes appear in ads all over the pages she browsed on the web. She finally broke down and bought the shoes. Like most people I know, I do a lot of web surfing, and I'm not comfortable with 3rd parties having access to my browsing habits. Julia shared a resource, Abine, which is a browser add-on that encrypts your information, scrambles your email address and blocks 3rd parties from accessing your information. 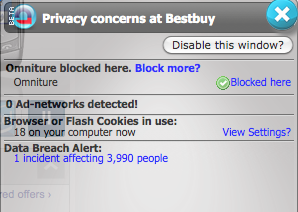 The coolest thing it does is that it pops up a little window in the corner of your browser when you go to a site telling you how many cookies have been placed on your computer by the site, and whether there are any ad networks or tracking sites in use. You can then block them with the click of a button. I have been using Abine for a day now and just to give you an idea of what I've learned about different sites, here is what came up when I went to Best Buy's website, which I have spent a lot of time on recently while searching for a washing machine. If you are someone who is concerned about their browsing privacy, check out Abine to see what it can do for you. I also suggest that you read or listen to the story on Fresh Air to learn more about what companies are tracking and how.